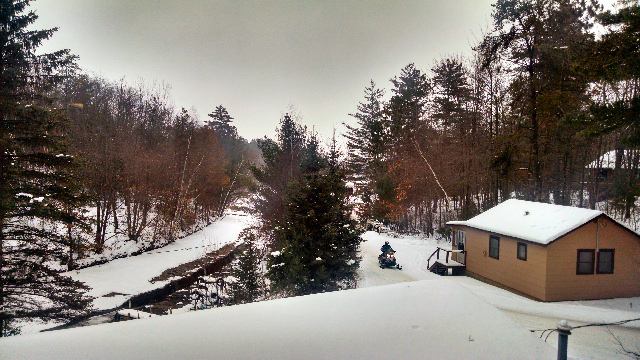 R & R Bayview Resort – A Fun Winter Stop on the Chippewa Flowage! We enjoy making the rounds in the Hayward area, stopping at area resorts and visiting with the many friends we’ve made in this northwoods of Wisconsin. Our winter haunts are very special indeed, with so few places open over winter, we treasure the ones that still forge through these dreary months to give their customers a warm place to gather! A favorite of ours is R & R Bayview Resort on the east side of the Chippewa Flowage. Their restaurant/bar’s dining area has a wall of windows overlooking the scenic bay they are on. 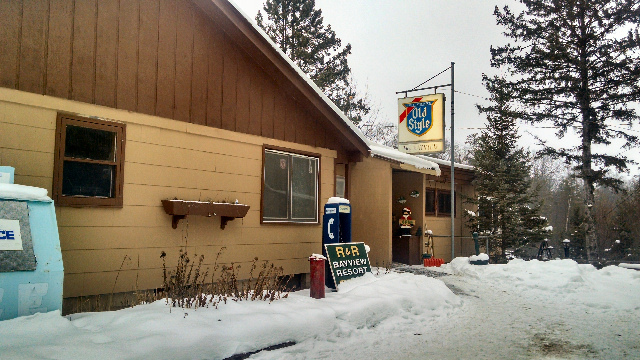 R & R Bayview Resort (Stop #52) is a member of both the Sno-Trails Snowmobile club and the Musky & Sno Club – why, just the other day we enjoyed an awesome breakfast in the glass-front dining area and watched as the snowmobilers flew across the flowage on Route 18, right up to the resort! View of the bay from the dining room! R & R Bayview Resort is open for business Thursdays-Sundays beginning at 8 am. Enjoy a full breakfast menu until about 3 pm, or come later for a limited winter menu of tasty appetizers and deep-fried foods until their regular season opens. In addition to the friendly atmosphere Tony and Lori create, you’ll love the good food, soft drinks and cocktails. They even sell premium gas for your sleds, at an affordable price! This entry was posted in Area Lakes, Dining & Resorts Hayward Area, NORTHWOODS LIFE, Snowmobiling and tagged cathy lareau, cathy lareau realtor, chippewa flowage, musky sno club members, places to eat on chippewa flowage, premium gas on chippewa flowage, R & R Bayview Resort hayward, R&R Bayview Resort, Resorts on Chippewa Flowage, RR Bayview hayward wi, sno trails members, snowmobile trails hayward wi, snowmobiling on chippewa flowage, stop 52 on chippewa flowage, tony & lori at R&R Bayview Resort. Bookmark the permalink.